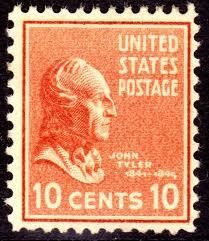 John Tyler is generally considered one of the “least effective” presidents in our history. So it was with apprehension and dread that I approached this former president’s biographies. But while his presidency was no more successful than I had expected, his life was surprisingly interesting. Tyler was known as the “Accidental President” since his elevation to the presidency was due to the death of William Henry Harrison – and the fact he was vice president at the time. As odd as it sounds today, when President Harrison died it was unclear whether a vice president actually “became” president or just “acted” in that capacity until a new leader could be elected. The Constitution was vague on this point and no president had ever died in office. But Tyler took the reins aggressively and set the precedent for presidential succession (later to be memorialized in the form of the 25th Amendment). Despite having once been a member of the Democratic party and still a strong states’ rights supporter, Tyler agreed to run as the Whig Party’s VP candidate in 1840. But he had a strong independent streak and an often inflexible view of his core values. So when one political party didn’t quite fit his style, he was willing to switch sides – but not his fundamental principles. The good news: his decision to run on the Whig ticket as VP nominee eventually led to his becoming president. The bad news: his agreement to align with the Whigs during that election was probably the worst tactical decision of his entire life. As president, he vetoed Whig legislation on core policy matters such as tariffs, a national bank and internal improvements and was summarily “ejected” from the Whig Party barely five months into his presidency. As a political pariah Tyler subsequently demonstrated the impossibility of being an effective president without the support of any major political party. Unfortunately, Tyler’s legacy also suffers from two major stains: he was a passionate defender of slavery and he is our only “traitor president,” having supported Virginia’s secession from the Union (many years after leaving the White House). History tends to reward those who back winners, and Tyler certainly had a knack for picking the losers. He did manage to sneak through an agreement to annex Texas days before his term ended, but largely in an effort to expand slavery; it made no lasting improvement to his legacy. * I began with Oliver Chitwood’s “John Tyler: Champion of the Old South.” This is the “classic” John Tyler biography and serves as a very good introduction to this former president. While the author is frequently criticized as a Tyler apologist, his defense of the man is well-reasoned and thoughtful and he rarely fails to highlight Tyler’s many faults and flaws. I appear to have found more balance in Chitwood’s analysis than most. My final Tyler biography was “John Tyler” by Gary May. Although I don’t typically include books of this brevity in my library of presidential biographies, I was surprised by its breadth, insight and impact. May’s biography is easy (almost effortless) to read, enjoyable and extremely efficient with the reader’s time. Ironically, May does a better job of piercing Tyler’s private life than other biographers despite the book’s slim size. Nicely done. Now time for President Polk? Don’t (quite) hold your breath…but Polk is coming up next! Still catching up with you, but if you are compiling a list for future reading, I recommend Robert Seager’s book “And Tyler Too.” It’s from 1963, and is in part a double biography of Tyler and his second wife, and it’s very readable. I’m always compiling the “next list” so I’ll look into this – thanks! John Tyler was the Accidental President and the President Without a Party. When I was talking to my father, who is a history buff and very into politics, about this book he didn’t even remember Tyler was a president. As for my biography of choice, I read Robert Seager’s, And Tyler Too A Biography Of John And Julia Gardiner Tyler. Seager did a valiant job making Tyler interesting to me, specifically covering his political career in decent detail. I had never heard of Julia before, but based on this bio Mrs. Gardiner Tyler and her family were quite influential in the local political social scene. They did not marry until late in his Presidency however, so her influence in Washington was minimal, but the addition of her story was intriguing. Based on other options, I don’t believe I will be reading a second Tyler biography…this adequately met my needs. I concur re: the quality of the Seager bio — really well done.